Do These 5 Things For Successful Dental Implants in Newark! If you’ve decided on dental implants to replace missing teeth, you’re making a great choice. Implants have changed the face of restorative dentistry forever because they’re the first option that actually feels like your own teeth. They also last much longer than dentures or bridges, so they’re a more permanent, cost-effective option as well. Not to mention that dental implants in Newark have a 98% success rate, which makes both patients and dentists happy. But even though 98% is high, a 2% failure rate really adds up when you consider that around 500,000 implant procedures are done each year. If you’re getting implants and would like to increase your (already high) chance of success, keep reading for 5 great tips for taking great care of your new smile! 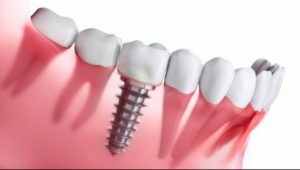 Dental implants are made of titanium, while the crown, bridge or denture that’s used to complete the implant is made from materials like porcelain or metal. It’s true that these materials can’t get cavities like natural teeth can, but that doesn’t mean you don’t need to keep your implants clean. That’s because an implant’s success relies on having clean, healthy gum tissue (and the jawbone underneath it) to support it and keep it in place. If it doesn’t have that, it can become loose and start to fail over time. It’s essential to gently but thoroughly brush around an implant at least twice a day and floss once. Also, be sure to ask your dentist or hygienist for a demonstration of how to floss – implants require a different technique than natural teeth. For smokers, the success rate of implants drops from 98% to about 85%, which is a significant drop. Smoking interferes with the blood flow to your oral tissues and ultimately impacts the ability of an implant to heal properly. In modern life, clenching and grinding are incredibly common. Unfortunately, it not only causes problems with natural teeth, it can also cause implants to fail as well. The good news is that wearing a nightguard can protect your implant and increase its chance of success. Although it’s relatively rare, sometimes implants fail because of an error made during the procedure. That’s why it’s so important to make sure your dentist has years of experience and has pursued advanced training in implant dentistry. Also, some offices offer “bargain implants.” Some of these offers may be legitimate, but, in other cases, these implants are done with inferior materials or techniques. Remember, a dental implant is an investment that will last for decades if it’s done with high-quality materials and methods, so it’s worth it to make sure it’s done by an experienced, well-qualified dentist. Regular visits with a dentist in Newark are important so that a professional can regularly monitor the health of your implant and treat any small problems before they become bigger problems. You’ll also get a professional cleaning at your checkup appointments, which is crucial to keep the gum tissue around your implant clean and healthy. Implants are a fantastic way to restore your smile and self-confidence after tooth loss. And, with these 5 tips, you’ll be able to make sure your new smile lasts a lifetime! Dr. Timothy Ganfield is a general and implant dentist in Newark who knows that a combination of high-quality dental work and the right maintenance habits at home lead to the best results. In addition to doing outstanding implant work, he always takes the time to educate his patients about how to care for their implants over the long-term. If you have any questions, he can be reached via his website or at (302) 731-4225. Comments Off on Do These 5 Things For Successful Dental Implants in Newark!